Scores of people have been killed and dozens more injured after a truck plowed through a crowd during Bastille Day celebrations in Nice, in what has been called “the worst attack” in the city’s history. The truck driver was killed by police. 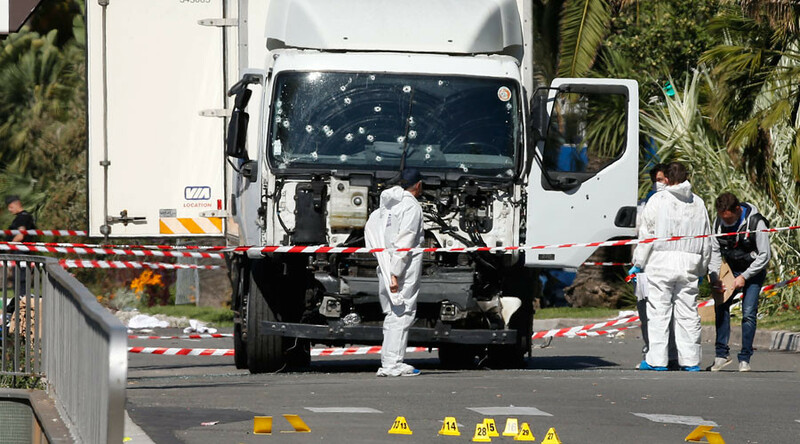 Investigators revealed on Sunday that the truck driver behind Nice attack had been driving around the city in his truck on July 12 and 13 looking for the most effective place to carry out the atrocity. French Prime Minister Manuel Valls says the driver who killed at least 84 people in Nice had recently been radicalized. “The investigation will establish the facts, but we know now that the killer was radicalized very quickly,” Valls said in remarks published on Sunday, Reuters reports. “The claim on Saturday morning by Islamic State [IS, formerly ISIS/ISIL] and the fast radicalization of the killer confirm the Islamist nature of this attack,” the Prime Minister added. Two more people have been arrested in connection with the Nice truck tragedy. A man and woman were arrested in Nice on Sunday for possible involvement, putting the total number of people detained in connection with the truck attack at seven, news agencies report, citing judiciary sources. Five of those previously detained remain in custody. Political analyst Pierre Schweitzer tells RT that unity in France took a big hit with this latest attack. Like other experts, he believes increasing or decreasing operations in the Middle East will not have any effect on the number of Islamic State attacks in Europe, because the terrorists are carrying them out because they are losing big on their home turf in Syria and Iraq. “Even if we didn’t [carry out] some new military action in Syria and the Middle East in general, I think the attacks will increase anyway, because ISIS is losing ground,” he says. The Islamic State terror group has claimed responsibility for the truck attack in Nice, France, that left 84 people dead, according to ISIS-affiliated Amaq news agency. At least three people were arrested in Nice on Saturday morning in connection with the deadly truck attack, BFMTV reported. Obama called “repugnant” the suggestions to ban Muslim immigration or place Muslims under surveillance, saying that this would aid the terrorists. “We should never do their work for them,” he told reporters in Washington, DC on Friday afternoon. Three US students, who were on a study-abroad program in France, were injured in the Nice terrorist attack and one more is still missing, the University of California in Berkeley said according to Reuters. The missing student was identified as Nicolas Leslie, 20. Two injured students suffered broken legs and the third one has a broken foot, the university added.